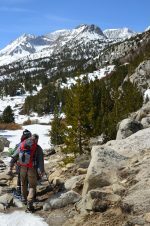 Strapping on snow shoes and slinging on hefty backpacks across their shoulders, CSUN students venture through the snow laden mountains of the Eastern Sierras. After hiking about two miles up from Rock Creek, the crew set up base camp. They rested just below the tree line at about 10,000 feet. 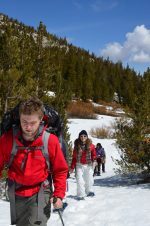 From there the guides Jared Tkocz, Jefferson Barstad and Michael Suazo led the students through the rules of backpacking to pioneering through the powder and ice- filled trails. Students learned how to maneuver through the snow, read the trails, and purify lake water into drinking water. At the end of the third day the crew traveled down the highway to stop at Manzanar which was one of the Japanese Relocation Camps in which the American government forced thousands of Japanese citizens to live during World War II. 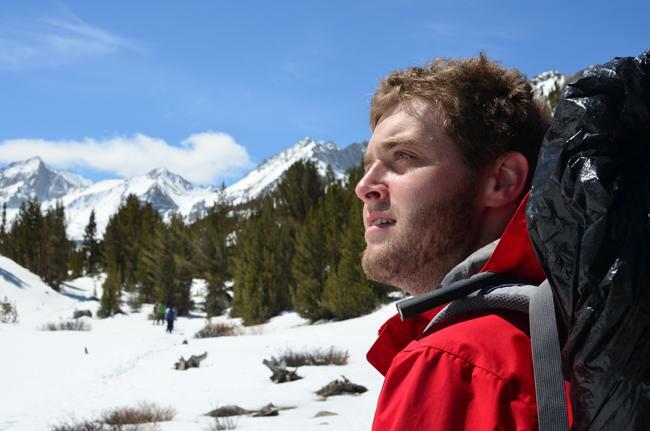 OA guide Jared Tkocz analyzes the trails and the melting snow for safer travels. Alejandra Garcia seen brushing her teeth while enjoying the view. CSUN students throw on their packs and ready themselves for a journey through the snow to the rivers and lakes running between the mountains. OA guide Jared Tkocz on the left and OA guide Jefferson Barstad at the center. 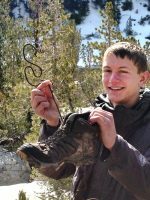 Frozen solid, OA guide 19-year-old Jefferson Barstad has to wait for his shoes to thaw out before he can lace up. The crew follows OA guide Jared Tkocz’s point as he leads them through the icy snow towards heart lake. Student Ani Chobanyan is close behind. Marching across dirt and snow asCSUN students make their way to the lakes towards the distant mountains. CSUN students heading back from the museum at Manzanar, a former Japanese relocation camp during World War Two. The American government abused it’s rights and forces thousands of American citizens from their homes during the war due to fear. Left to Right: Michael Suazo, 25, (guide) graduate in Mechanical Engineering, Ani Chobanyan, 22, Psychology major, Lindsey Barney, 23, Child Development major, Natalie Flores, 20, Clinical Psychology major, Alejandra Garcia, 26, Judith Gonzalez, 24, Anthropology, Jared Tkocz, (guide) 21, Theatre, Usman Khan, 21, Consumer Affairs, and Jefferson Barstad, (guide) 19, Biology.